Over time, the skin can take on a dulled, worn look due to environmental factors combined with the natural aging process. Laser skin resurfacing using DOT Therapy offers a gentle yet effective way to repair damaged skin cells and restore radiance to your complexion. Dr. Stephen Kay is a well-known plastic surgeon serving the Bethesda-Chevy Chase metro area with a wide range of surgical and nonsurgical cosmetic treatments. In addition to laser resurfacing, Dr. Kay has helped thousands of women and men from the greater Washington D.C. region and beyond look their best with cosmetic surgery procedures for both face and body. Please contact us online or call our Chevy Chase plastic surgery practice at 301-951-5120 for more information on DOT Therapy. Is DOT Therapy Right for You? The best candidates for laser skin resurfacing using DOT therapy have noticed early signs of aging, like fine lines around the eyes or mouth, combined with a loss of vibrancy in their complexion. DOT Therapy can also help improve the appearance of acne scars or other skin imperfections, as well as restore a more even skin tone. Please visit our before and after photo gallery to see real patient results that are possible with DOT Therapy laser resurfacing. The costs associated with DOT Therapy laser resurfacing can vary depending on the size of the treatment area and other factors. Dr. Kay and his staff will go over all the available options for cosmetic surgery financing that can help make your laser skin resurfacing even more affordable. DOT Therapy (Dermal Optical Thermolysis) is a new type of CO2 laser resurfacing that’s gentler on your skin without compromising your final results. The DOT uses a polka dot pattern to create thousands of controlled micro injuries, leaving alternating spaces of intact, healthy skin. This unique treatment configuration promotes faster healing, as the skin can rejuvenate more quickly from the edges of each individual dot rather than needing to heal the entire surface of the skin. This means that you can enjoy a faster, safer and less invasive form of laser resurfacing that allows for a higher level of customization to meet your specific skincare concerns. Dr. Kay can perform a full session of DOT Therapy in about an hour for most patients, depending on the size of the area being targeted and whether other treatments will be included at the same time. During treatment, Dr. Kay passes the DOT Therapy SmartXide Laser over the treatment area, which delivers controlled pulses of laser energy using customized settings that are tailored to your skin’s needs. Dr. Kay can also adjust the settings throughout the session for more accurate treatment in different areas. After your session, you may see some mild redness and feel a sunburn-like sensation that should fade quickly. It’s important to take care of your skin with a committed regimen of medical grade skincare products to promote optimum healing and results. 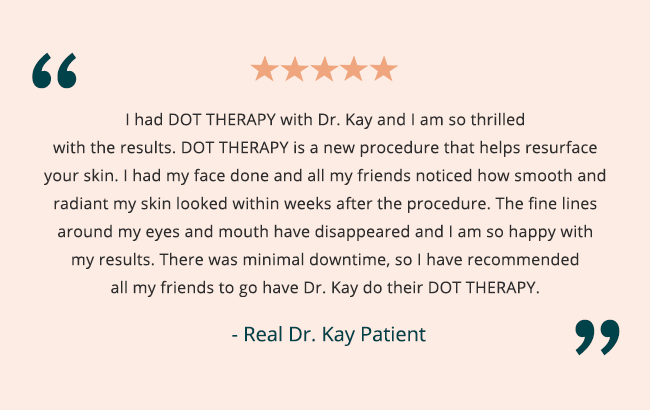 Although many patients see significant improvement after only one session, Dr. Kay may recommend multiple treatments, or suggest combining DOT Therapy with other skin rejuvenation procedures to take your results a step further. Compared to traditional laser resurfacing, downtime after DOT Therapy is very minimal, with most women and men returning to their normal routines in just a few days. Because DOT laser resurfacing stimulates collagen production, results typically show continued improvement over the weeks and months following your treatment. After your session, you should notice a new firmness to your skin along with a healthy glow, smaller pores and diminished wrinkles. Although nothing can stop the aging process completely, the results of DOT Therapy are long-lasting, and can help you look rejuvenated and refreshed for years to come.